After accidentally shooting a bank robber, Darcy Duncan becomes marshal of a town as accident prone as herself. 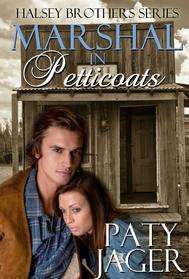 Darcy’s taken care of her younger brother the last five years, and she’s not about to take orders from a corrupt mayor or a handsome drifter, whose curiosity could end her career as a marshal and take away their security. 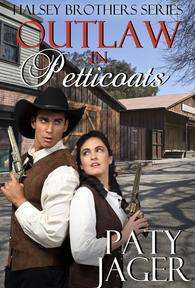 ​Gil Halsey arrives in Galena looking for his boss’s son turned outlaw. Getting the young man back to the ranch will seal the foreman’s job. 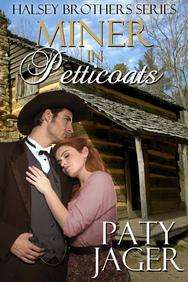 When he discovers the town’s new marshal is a passionate woman with high regard for family, he turns to protecting her. 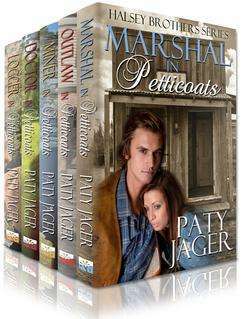 Darcy reunites him with his estranged family as they romp through gold country after outlaws. Maeve Loman has had her heart crushed before; she isn’t about to have it happen again. When she takes Zeke Halsey up on his offer to help her discover the truth behind her father’s disappearance, she’s sure she can control her traitorous body and not fall for the man’s considerable charms. ​Zeke Halsey has wanted Maeve Loman since he first set eyes on the prickly schoolteacher. Even as she thwarts his advances, he sees the desire burning in her eyes. Offering to help her find her father, he hopes to prove he’s not going anywhere. Captured by outlaws, they soon realize how much they’re willing to sacrifice for the other. Ethan Halsey, the oldest of the Halsey brothers, is determined to fulfill his father’s wishes to provide for his brothers. The only drawback is a feisty woman who refuses to part with the land he needs. Aileen Miller has had two husbands. She isn’t about to allow another man to dictate her life or the lives of her two children. Can they work together and achieve their goals or will their growing attraction shatter their dreams and disrupt their families?. Dr. Rachel Tarkiel gave up on love after a devastating accident and settled for a life of healing others. She’s content with her situation until handsome Clay Halsey shows up and inspires her to want more. 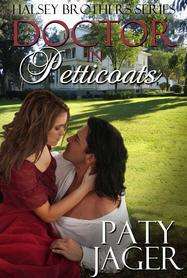 ​Blinded by a person he considered a friend, Clay curses his circumstances and his limitations. Meeting the intriguing Dr. Tarkiel who shows him no pity, Clay begins to realize he is still a whole man and he can make his own happiness. ​Can their love overcome their internal fears and the obstacles life throws at them or will a mysterious man keep them apart forever? Hank Halsey believes he’s found the perfect logging crew – complete with cooks – until he discovers Kelda Neilson would rather swing an axe than flip eggs. As he sets out to prove women belong in the kitchen, he’s the one in danger of getting burned. ​Strong and stubborn, Kelda Nielsen grew up falling trees, and resents any man who believes she’s not capable, until Hank. He treats her like a lady and has her questioning what that means. ​As Kelda and Hank’s attraction builds, she hires a cook so she can sneak out and work in the woods. But will her deceit ruin her chance at love or will hardheaded Hank realize it’s more than his love that puts a sparkle in Kelda’s eye?